Demand for more efficient fuel delivery system is rising consistently in order to comply with the stringent emission norms and boost fuel efficiency. The common rail fuel injection system is proven to be a prominent system in enhancing engine fuel efficiency. Most advanced engines are equipped with common rail fuel injection system as the fuel pressure in the fuel delivery system can be maintained irrespective of the engine speed and engine load. This, in turn, offers better quantity of fuel to be injected, better control over injection timing, and it provides enhanced spray penetration and mixing. This results in smooth engine running and increased engine efficiency. The fuel pressure in a common rail fuel delivery system varies from 100 bar to 2500 bar. Each component of the fuel delivery system must be designed and manufactured with precision and accuracy in order to handle this tremendous fuel pressure. The fuel rail is a key component in the fuel delivery system, which handles high pressure fuel and supplies it to the injectors. The typical fuel rail pressure at engine idling ranges between 300 bar to 400 bar. A fuel rail is designed to handle fuel pressure up to 2500 bar, which is employed in extremely powerful engines. Consistently increasing demand for vehicles is a prime driver of the automotive fuel rail market. Demand for vehicles is consistently increasing, especially from rapidly developing nation, such as India, China, and other countries in Asia. Rise in demand for vehicles is fueling the automotive fuel rail market. Demand for electric vehicles such as hybrid electric vehicles and plug-in hybrid electric vehicles has been rising for the last few years owing to government subsidies, increasing concern about rising pollution, execution of new and more stringent norms, and consumer preference for high efficiency vehicles due to increased fuel prices. This increased demand for hybrid electric vehicles is also driving the demand for automotive fuel rails. In North America, there is one car for every two persons. This number is much higher in the countries in Europe. This high penetration of passenger cars per capita is gradually hampering the demand for it and also for fuel rails. This is a key restraint of the automotive fuel rail market. Moreover, increased demand for completely electric or all electric or battery electric vehicles is a key restraint for the automotive fuel rail market. A battery electric vehicle does not require an engine and consequently, a fuel rail systems. Governments of various nation, globally, are focusing on the introduction of battery electric vehicles in order to meet the agreement of Paris Climate Accord, signed in 2015. According to this agreement, countries have to keep the global temperature change well below 2°C. Consequently, governing bodies are providing considerable subsidies for battery electric vehicles. Demand for battery electric vehicles is rising significantly across the globe. China and Norway has significant number of all electric vehicles, and the demand for them is increasing exponentially across other countries. This is likely to hamper the automotive fuel rail market. Fuel rails have to handle significantly high pressure. Therefore, they need to be designed and manufactured accurately. Furthermore, they need to possess properties such as corrosion resistance, thermal conductivity, and formability. Considering all the parameters mentioned above, steel is the most suitable material to manufacture fuel rails. Steel fuel rails possess longer lifespan. In some cases, aluminum is used as an optional material for fuel rails. When weight is of prime concern, aluminum provides superior advantage. It has density of about 2700 Kg per cubic meter, while steel has a density of about 8000 Kg per cubic meter. Aluminum is incapable of handling high pressure fuel and hence, aluminum is preferred for light duty applications only where fuel pressure is well below than that of the heavy duty application. Common rail fuel injection systems are being incorporated in engines since the development of diesel engine. Consistent research and development have prompted fuel rails to become an essential part of every internal combustion engine. Globally, petrol is the most widely utilized fuel for automobiles. Governing bodies and consumers prefer petrol-fueled vehicles, as petrol is less polluting and provides smoother engine running. Governing bodies are emphasizing on reducing vehicle emission owing to the increased global warming. Consequently, governments of various countries such as the U. S., Germany, France, and Brazil are promoting petrol vehicles, by imposing comparatively lower taxes and prices than diesel vehicles. Recently, Germany, France, and the U.K. announced a ban diesel vehicles, and other countries are also planning to do so. Therefore, the market share held by the diesel segment of the automotive fuel rail market is anticipated to decline significantly during the forecast period. Inline engines are a highly preferred type of engine that is utilized in vehicles. V-engines have more advantages, owing to their lower cost and simplicity; however, inline engines are widely used. V-engines require two cam shafts and two fuel rails, which makes it complicated and expensive. The inline segment of the automotive fuel rail market accounted for 88.16% share of the total market, in terms of revenue, in 2017. The segment is likely to expand at a CAGR of 2.43% between 2018 and 2026. Demand for electric vehicles is increasing due to the rise in global warming and emission and increased concern about it among governing bodies and consumers. Hybrid electric vehicles and plug-in hybrid electric vehicles are witnessing significant demand owing to considerable government support. North America, Europe, and various countries from Asia Pacific, such as China, Japan, and Australia have a significant number of electric vehicles. Plug-in hybrid electric vehicles require charging facilities. North America and Europe have well developed infrastructure for plug-in hybrid electric vehicles; however, countries in Asia Pacific and Middle East and Africa lack electric vehicle infrastructure. Consequently, these regions witness significant demand for hybrid electric vehicles. Fuel rail has a long lifespan, which equals to the life of the engine. Generally, a fuel rail does not malfunction or get damaged. Replacement of a fuel rail is necessary in very rare cases such as a vehicle crash, where the engine is significantly damaged. Therefore, the OEM segment of the automotive fuel rail market is a highly attractive segment, and accounted for a major share of the market, in terms of revenue, in 2017. North America is a significant market for commercial vehicles. More than 60% of total vehicles in North America are commercial vehicles. North America and Latin America witness a consistent demand for commercial vehicles owing to the large mining industry and the expansion of construction, agriculture, and manufacturing industries in these regions. China and India are pillars of the global automotive industry. These two countries are leading producers and consumers of automobiles. Dense population, scarcity of vehicles, and increased per capita income are boosting the demand for passenger vehicles in these countries. The passenger vehicle segment dominates the global automotive fuel rail market owing to huge number of passenger vehicles across countries in Europe and Asia Pacific. Asia Pacific accounts for about 50% of total vehicles globally. Therefore, Asia Pacific dominated the global automotive fuel rail market. The global automotive fuel rail market is dominated by the presence of several global players. A few them include Cooper Standard, Magneti Marelli S.p.A., Roberts Bosch GmbH, Nikki Co., Ltd., Keihin Corporation, Landi Renzo S.p.A., Linamar Corporation, Standard Motor Products, Inc., Continental AG, ASINI SEIKI Co., Ltd., Sanoh Industrial Co., Ltd., and TI Automotive. 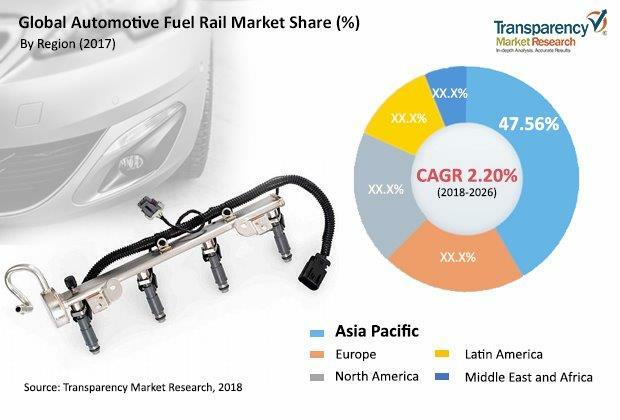 The automotive fuel rail market is witnessing several merger and acquisition activities, which are majorly focused on the development of lightweight and fuel efficient fuel delivery systems. This report analyzes and forecasts the market for automotive fuel rail at the global and regional level. The market has been forecasted based on revenue (US$ Mn) and volume (Million Units) from 2018 to 2026. The study includes drivers and restraints of the global automotive fuel rail market. It also covers the impact of these drivers and restraints on the demand for fuel rail during the forecast period. The report also highlights opportunities and future scope in the automotive fuel rail market at the global and regional level. The report comprises a detailed value chain analysis, which provides a comprehensive view of the global automotive fuel rail market. The Porter’s Five Forces model for the automotive fuel rail market has also been included to help understand the competitive landscape in the market. The study encompasses market attractiveness analysis, wherein product is benchmarked based on their market size, growth rate, and general attractiveness. The study provides a decisive view of the global automotive fuel rail market by segmenting it in terms of fuel type, engine type, material, electric vehicle type, sales channel, vehicle, and region. These segments have been analyzed based on present and future trends. Regional segmentation includes the current and forecast demand for fuel rail in North America, Europe, Asia Pacific, Latin America, and Middle East & Africa. The report also covers demand for individual segments in all regions. The study includes profiles of major companies operating in the global automotive fuel rail Market. Market players have been profiled in terms of attributes such as company overview, financial overview, business strategies, recent developments, executive bios, and manufacturing footprint. The market for fuel rail is primarily driven by the increasing demand for passenger vehicles across the globe. The report provides the estimated market size of fuel rail for 2017 and forecast for the next nine years. The global market size of fuel rail has been provided in terms of revenue and volume. Market numbers have been estimated based on fuel type, engine type, material, electric vehicle type, sales channel, vehicle, and regional segments of automotive fuel rail. Market size and forecast for each fuel type, engine type, material, electric vehicle type, sales channel, and vehicle have been provided in terms of global and regional/country markets.